Mommy Gossip: "Tina, You Fat Lard! Come Get Your Dinner!" "Tina, You Fat Lard! Come Get Your Dinner!" Yesterday, I rounded the corner leading up the hill into my neighborhood—my neighborhood in one of the biggest cities in Utah, not in some small rural area. And... straight ahead of me was a llama walking intently up the hill right in the middle of the road. I slowed down. Stopped. Did about three double takes. And, started laughing hysterically. I can't confirm whether I was laughing about the llama in the road or my great memories of watching Napoleon Dynamite... especially when I watched it with my entire family at our last Johnson family vacation to Mt. Rushmore. Oh! Did I mention we watched it in Spanish with English subtitles? Great memories! Anyway... this llama laughter moment made me realize that life is far too serious and how important it is to take advantage of every good moment, however small or short lasting they may be. Too much crap tries to work its way in and fill the nooks and crannies of our lives. 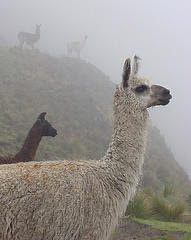 And seriously, life is too short to not stop and laugh at the llamas! I hope you all have a great day filled with small, yet funny, moments! When your title popped up in my reader I laughed out loud. I love that movie. Hehehe! I am ALL for good llama laughter...it makes things much easier to handle all around. :) Im glad you blogged this story...it's too good not to! You can't take a moment for granted, and yet, we all too often forget this. I have still not gotten through Napoleon Dynamite, but want to. My husband refuses to watch it with me. In fact, we went to the movies to see it, and he begged me to leave after about 10 minutes. So we left...goddammit. I tottaly agree the world can be to serious, you shoul come and take part in my tell a joke tuesday blog or read some of the jokes and stories. it has mr linky too. Add another laugh to your list Jyl! Thanks, I needed that.